Rachel Carr is the Chef and Culinary Manager at the Wanderlust Hollywood Café. Stop by for a bite! With the arrival of cooler weather, all I want is to curl up with a good book and a mug of something warm. 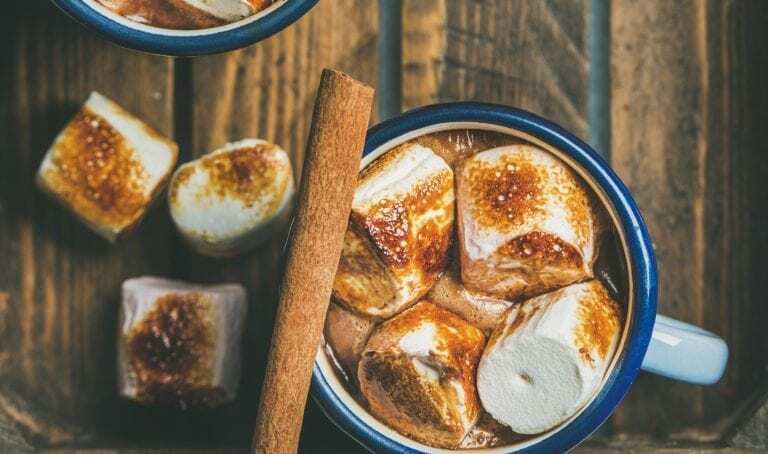 Yup, it’s that time of year when I reach for one of my favorite holiday staples: hot cocoa. Reishi and Chaga are both mushrooms and adaptogen herbs, meaning they can help fight the negative effects of stress, such as increased inflammation, lower energy levels, hormonal imbalances, and damaged blood vessels. Various studied have repeatedly shown that Reishi mushrooms have antioxidant abilities that strengthen the body’s defense systems against autoimmune diseases, heart diseases, allergies, and cancer. He Shou Wu is widely used in Chinese tonic herbalism, and used to promote health aging by fortifying the muscles, tendons, and bones. Ashwagandha is a popular herb with a plethora of health benefits including (but definitely not limited to), protecting the immune system, combating stress, improving cognitive ability, reducing anxiety and depression, and stabilizing blood sugar. Finally, Maca is an adaptogen known for its ability to increase fertility, regulate the immune system, balance hormones, and improve energy levels, stamina, memory, and focus. You can find most of these herbs at a nearby health store or online. I also use vegan marshmallows—be careful to read the ingredients when you’re shopping, as many marshmallows contain gelatin from animals. Toast your marshmallows over an open blame before topping for an extra cozy touch. You can store the blended drink in your refrigerator and heat as desired. It will keep nicely for a week or two. It is also delicious iced or as a base for a smoothie with a banana or two. This post originally appeared on rachelcarr.com. For of Rachel’s recipes, click here. For more mindfully-inspired recipes, check out the Wanderlust Find Your True Fork cookbook, available online and through all major book retailers. Rachel has been preparing raw food/vegetarian/vegan cuisine for over 11 years. Previously, Rachel, was the Head Chef and Manager of a raw food cuisine restaurant, Six Main, which she co-owned in Chester, CT. Rachel has also worked as a Chef in a number of top rated raw food, vegetarian restaurants in the Los Angeles area such as Cru and Chloe.